For adults, vegetarianism can be a healthy dietary choice. With proper planning, most adults can get the same or better nutrients from a vegetarian diet that they get from an omnivorous diet. 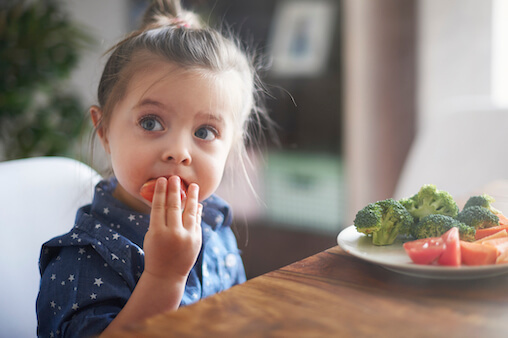 Vegetarian diets for children, though, might not seem as easy — their growing bodies require proper nutrition to reach their full potential. Vegetarianism can be safe for kids as long as their parents oversee a nutrient-rich whole-foods diet. Here’s what you need to know before embarking on such a program with your child or children. For every child or family, the choice to go vegetarian will be different. For some, their religious beliefs stop them from eating meat — and this dietary choice applies to the entire family. Some parents might choose to follow vegetarian diets for health reasons, preparing the same meat-free meals for their kids. Some children might decide to go vegetarian on their own. Some care deeply for animals, while others have learned about the adverse effects ranching has on the Earth. Of course, they might also opt for vegetarianism for health reasons. Protein: In most cases, people get their protein from animal-based sources. It turns out plants have lots of protein, too. If the bulk of their diet is whole plant foods they’ll get plenty of protein. Many people know that chickpeas, lentils, tofu, seeds, nuts, whole grains are plant-based sources of protein. What people often don’t know is most vegetables have plenty of protein as well. They can get extra protein in eggs, cheese, and Greek yogurt if they choose to eat those. The problem comes if they get most of their calories from prepared or packaged vegetarian foods. They may have too little protein. Zinc: You can get plenty of zinc in dairy, legumes, seeds, nuts and whole grains, but not necessarily in packaged or processed vegetarian foods. Without the right amount of zinc, children might experience stunted growth, as well as a weakened immune system. Calcium: As with protein, if kids get most of their calories from plants and eat plenty of vegetables every day they’ll have no problem with calcium, whether or not they eat dairy, but if they get the bulk of their calories from packaged or processed foods, calcium might become an issue. Try focusing on including calcium-rich foods in your child’s diet. Great sources of calcium include foods like tofu (always check the label on your tofu), tempeh, sesame seeds, greens, and figs. Vitamin B12: This one’s important because it ensures your child has healthy blood cells and nerves. It’s found in most animal products so if your child eats dairy and eggs this won’t be a problem. For vegans, meat substitutes such as tempeh, tofu, and nutritional yeast will all have some B12s. A vegetarian diet can help adults improve their health — without high-calorie and high-fat proteins, they can slim down easily. For kids, though, it’s vital to make sure they’re getting the proper balance of proteins, fats, carbohydrates and overall calories to keep them energized and nourished throughout the day. The amount of protein, fats, and carbohydrates your child needs depends on his or her gender and age. It’s wise to work with your child’s pediatrician as they grow to determine the best amounts at each age. Children of all ages can be vegetarian. Infants, for instance, can drink breastmilk and get all the nutrition they need, except for iron and vitamin D. If their mother doesn’t get B12 in her diet, though, she should take supplements to ensure both she and baby get enough of this vital vitamin. Toddlers will always be picky about what they eat, so be willing to make a few compromises along the way. This is especially true for parents who want their children to be vegan — they might have to take a break during this stage so they don’t suffer from any nutritional deficiencies, which are already common in this age range. As kids get older, it becomes easier to balance their plates and, therefore, their diets. Always consult with a medical professional to make sure this lifestyle’s a safe one for your family. A doctor can also tell you if your child is deficient in any vitamin or mineral, and how they can get it from a plant-based source or supplement. With a medical professional’s green light, you should feel more than confident to allow your child to follow a vegetarian diet. With the above information, it should be easier for you to oversee this healthy eating plan for them, too.